Update: There is a newer way to make an AR subscription and it is much easier. For more information, click here. If you already don’t have a code list you can click on the star icon on the Action Replay Code Manager (orange circle) and under the “my code lists” area it should appear (red oval). 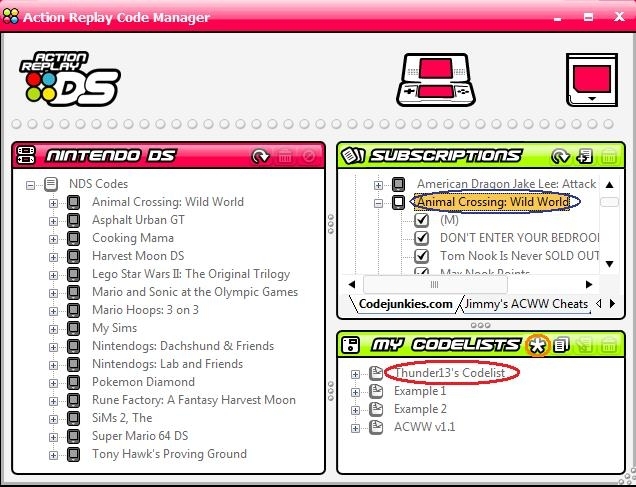 Next, you have to put a game in your code list, which you can get from your subscriptions from codejunkies.com (blue oval). All you do is drag and drop the game you chose onto your code list and you’re done. If you want to customize it you can drag and drop cheats or codes from more sources if you wish. Remember to add the tab. Finally, you have to add </subscription> to the bottom of the code list add put a tab in front of </codelist>. Now you have to upload this document onto your own website and you can test it to make sure it works. There is a new and much easier way to make subscriptions, it involves no coding or .xml tags whatsoever. AR Subscription Maker allows you to edit XML code lists for the DS Action Replay. It is useful for people who wish to edit or modify their own codes, but don’t want to figure out how the XML works. It generates nicely formatted XML as output. You can download it by clicking here.